Not that many years ago, ZTR came into the vocabulary of the landscape maintenance and gardening crowd as a description of riding lawnmowers that boasted Zero Turning Radius. Now a new acronym has been introduced into our environmentally aware consciousness, that of ZEV, which means Zero Emissions Vehicle. One such vehicle is the Nissan LEAF™. Why no emissions? Because the car is a 100% electric, no-gas automobile. No gas equals no emissions, equals no pollutants being thrown into the air we humans breathe. The power source is an 80 kW AC synchronous electric motor fed by a 24 kWh lithium-ion battery. With the battery fully charged, the Nissan LEAF™ has an estimated driving range of 100 miles. Since 95% of the commuting population drives less than 100 miles a day, this automobile is a viable alternative to standard internal combustion gasoline-powered cars currently clogging our highways and polluting our atmosphere. 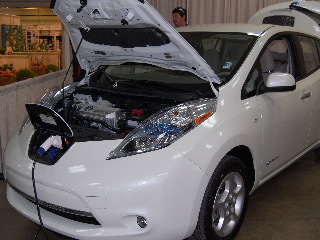 And the Nissan LEAF™ is not a stripped-down basic science experiment kind of vehicle—it’s a made-for-comfort, ready for prime time luxury car with heated seats, heated steering wheel, 5-passenger seating capacity, and the latest technology to provide feedback on what’s going on with your marvelous driving machine. That technology tells you how much charge is left in your battery and how many miles remain in your driving range. The car also gives you feedback on how efficiently you are driving and displays icons telling you of nearby charging stations. And, if you’re in a hurry to get there, the car is capable of speeds up to 90 mph! Safety and security features are plentiful, too, with 6 standard air bags, tire pressure monitoring system, traction control system, and a vehicle security system. Cruise control, power windows and power mirrors, trip computer, push button start……we could go on and on about all the things the Nissan LEAF™ has. But the most important thing about this car is what it doesn’t have—and that’s toxic emissions that pollute the environment. A green idea that’s a great idea—the Zero Emissions Vehicle—the ZEV.